Zionsville Fire Dept. public educator Vincent Randolph can get his safety messages across by simply taking a drive. His department vehicle was specially wrapped with messages by Indy’s Pro Graphix a month ago. Since the vehicle was obtained in July 2018, Randolph said it has been used to help the public education division transport items, materials and resources to events. Randolph loads materials in the vehicle and delivers items such as handouts, fire helmets, spray hoses and photo props. 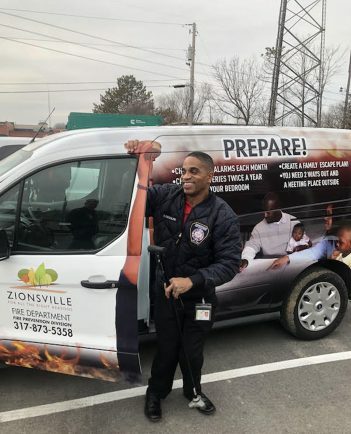 The idea to wrap the vehicle with messages was developed during a brainstorming session with Randolph, Fire Marshal Joshua Frost and Prevention Inspector Ron Lipps. The three focus areas of “Prepare, Prevent, Practice” are on the van. Randolph said at stoplights he sees people in his rear-view mirror engage in discussion.